The following is a guest post by New York art teacher Jake Jacobs. In it, he discusses TeachStrong, yet another restyling of corporate reform that appears to have been designed to offer Democratic presidential hopeful Hillary Clinton a convenient education platform, complete with national teacher union involvement. On November 20, 2015, I read a brief FB post by Jacobs on TeachStrong, Clinton, and AFT President Randi Weingarten. I asked Jacobs if he would expand his thoughts into a blog post. I give you Jake Jacobs. Recent shifts in Hillary Clinton’s education platform coincide with the news of a new alliance forged between lobbyist groups and high ranking leaders of the nation’s two biggest teacher unions, but their priorities are sharply at odds with grassroots parent and teachers unwaveringly opposed to the proliferation of high stakes standardized tests. Hillary’s sudden pronouncement that there is “no evidence” showing test scores should be linked to teacher evaluations is bittersweet for actual educators – not because it’s so late, but because the very same body of research tells us that standardized test scores shouldn’t be used for anything. Parents across the political spectrum agree that distant mandates for over-testing have reached boiling-frog levels, particularly for students with continually unmet needs. The idea of increasing control and scrutiny on teachers to fix the problems in US schools is not only barking up the wrong tree; it’s unpopular, unsuccessful, and extremely wasteful, costing localities millions per year to comply with unfunded federal and state mandates. Undaunted, the recently-announced “TeachStrong” campaign linked dozens of lobbyist groups, think tanks and civil rights organizations together as Gates, Walton, Broad and other “philanthropic” foundation funding blankets all corners of Washington. The ringleader is the Center for American Progress, a powerful, influential, many-tentacled policy shop founded by Clinton administration alum John Podesta, and now populated by key Clinton and Obama administration education officials fresh through the revolving door. The campaign lays out nine priorities that ignore wholesale the most obvious, basic problems facing US school children instead turn the focus of more policy tinkering squarely onto teachers. Despite escalating contention, the long term plan is still in play: Manufacture a “crisis” in US schools invoking fear of global competition, all based on test scores. The latest sleight-of-hand occurs when CAP and its TeachStrong camp maintain the half truth, “teachers are the greatest in-school factor affecting a child’s education,” in the face of research showing out-of-school considerations dwarf all others. As Hillary’s allies anticipate an easy win against a floundering Republican field, the plan to “reimagine” every phase of the teaching profession will be a blinder-strapped, free-for-all for the education consultancy sector. Comprised of 4,400 employees and a $68 billion budget, the US Department of Education (USDOE) is a like a gigantic old tanker that does not quickly turn around without considerable time spent floating in the wrong direction. Thus, the timing of Hillary’s pronouncement is no coincidence, coming just after a backroom deal had been cinched by the joint House-Senate conference committee on Education to eliminate Obama’s mandates for test-based teacher evaluations even as it preserves the federal mandate on those same annual tests for all children in grades 3-8– and all the profiteering, waste and fraud that goes with it. Tellingly, the new pact doubles down on Common Core (under a new name, of course) along with a raft of privatized, centralized accountability proposals, just as the battles over standards and evaluations increase fifty-fold. 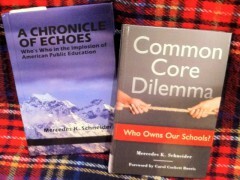 It may have seemed like progress when Congress struck down federal requirements or enticements for states to adopt standards, until one realizes that making it a state-based decision means every state house across the US will now be inundated with lobbyists looking to replicate a proven edu-reform pay for play model. Seeking to unite disparate (but ostensibly Democrat-friendly) groups, TeachStrong looks to be suggesting teachers should be headhunted, certified, and mentored by privatizers and centralized agencies, with the stand-outs recruited for rewarding private sector jobs where they might continue overseeing the same programs for “ten years or more.” They head-scratchingly propose making it harder to be certified to teach, turning away the more independent-minded, innovative candidates in the belief that “50 state” solutions can replicate successful teaching practices “at scale” despite the inconvenient reality that every state, district, school and classroom is different, with its own set of complex particulars. Also notable in this festival of election year deal-making is the tactic to generate teacher buy-in by promising higher pay. The idea to franchise out education nationally with more one-size-fits-all metrics and more stringent training and oversight will be so lucrative for the well-positioned educrats who bet on Hillary early, that they’re even willing to share the spoils with teachers, especially those willing to upend their profession to make it more market-friendly. Also juxtaposed against this is the question raised in a recent Democratic presidential debate: Do we really think Wall Street doesn’t expect anything in return for the millions in donations and speaking fees they have given Hillary? TeachStrong gets out ahead of this, pairing a diverse set of non-profits and advocacy groups with Super PAC donors (such as CAP’s pro-Hillary Super PAC “Action Fund”) in advancing the latest promise to engineer a magical race of super teachers who will turn previously uneducable students around. Randi must have had pressure to quietly sign the AFT onto TeachStrong’s priorities. She knows TeachStrong’s agenda is actually the opposite of what real teachers are fighting for and that such an agenda undermines individual autonomy at every step as it actually rewards compliance. TeachStrong promises to change tenure into something different– and cryptically dependent on TeachStrong’s definition of the word “ meaningful”. It wants to provide teacher “support” hinging on an elusive definition of “need,” and that raises hackles right away. History shows that these rehashed corporate reform policies inordinately end up being distractions to and intrusions into teaching: The bottom line is that anything defining success via standardized tests saps local control. 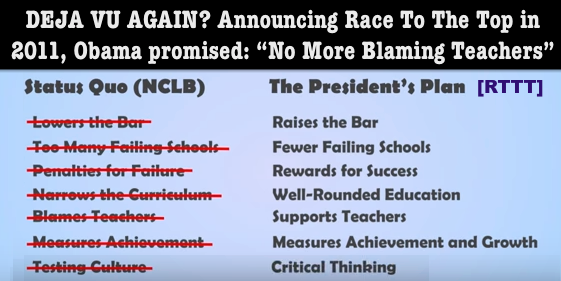 We remember all too well how Obama promised in 2011 to stop blaming teachers– just before Race to the Top dropped the privatized test-and-punish hammer, making “success” dependent on hypothetical projections of future student income and failure almost automatic for the vast majority of students. If you live in NY, you saw last year how Randi wields her power — transactionally — as she endorsed Governor Cuomo’s running mate with a sneaky, zero-hour robocall. She even admitted it was an exchange, repayment for previous support (a particular floor vote?) that she later regretted. It’s been said Randi single-handedly turned back the surge by NY Times-endorsed, disruptor candidate Tim Wu to win the lieutenant governor’s race—an office that he vowed to use to expose Albany corruption. More recently, Randi’s decision to prematurely endorse Hillary outraged teachers across the spectrum who only wanted to see the democratic process have a chance to play out. This gave ammo to anti-teacher types claiming that the unions being in-the-tank proves how teachers are greedy, entrenched and out for ourselves instead of the students. I say to Randi and Hillary: Instead of smothering teachers with unwanted “support” dreamed up by non-educators, consider more basic help for needy students and their families providing home-based, whole-child wraparound services that do not interfere with the school day, funded in part by the savings realized from a “just go away and let me teach” model. This is not a classroom issue; it’s class war, and you two are bending over backwards to paper over the hair-on-fire priorities and disregard systemic inequity, starting with a rigged tax code, bought government at all levels, a broken election system and a tone-deaf, runaway USDOE. Instead, you’ve laid out a recipe of privatization through perpetual market-based tinkering, verticalization and franchisation that would make McDonalds or Walmart blush. Isn’t the very existence of Teach for America (TFA) and USDOE’s considering TFA “highly qualified” proof enough that the government doesn’t think training and experience matter much? Still, with TeachStrong, you choose to publicly align with TFA. We all see that inequity and austerity have made our schools more segregated than ever, and as nutty as the Republicans are, they are at least honest that they work for the 1%. When the big Democrats pretend to be fighting for us, it’s painful because recent history shows they are happy to overlook Wall Street’s fraud, cashing their checks while asking us to believe there is no conflict of interest. Democrats are burying scientific research showing that student performance is most directly linked to economic status. Teachers experience every day the reality that learning obstacles stem from toxic stress or broken homes, with teacher effectiveness playing a far smaller part. Beltway politicians won’t acknowledge how crime, drugs, poor nutrition, teen pregnancy, incarceration and deportation ripple through whole schools. Even the natural variance in child development is ignored as students within a grade (who are already as much as a year apart) are all assessed on an assembly line no matter their pace of physical, cognitive or emotional maturity. For high-performing districts with decades of proven success, the TeachStrong agenda is just another iteration of NCLB and RTTT looking to waste precious time and money. And we see struggling schools targeted for takeover by unelected officials using these specious metrics and programs to supersede community voices. Randi has lofty ambitions. However, career teachers who try to combat test-centered, professional stress even as they set examples for young people need a leader who will fight against the abuses of campaign finance at the highest levels of government, not spearhead the effort. We all recognize legalized bribery when we see it, and the ends do not justify the means. It’s also a biting irony that Hillary would do better, not worse, at the ballot box if she swore off sleazy corporate cash. In fact, it would be a guaranteed landslide, delivering what the teeming masses have waited for decades to see. But that’s not what her candidacy is about, and that is why teachers need to continue the fight to fix schools despite the corporate-reform-friendly alignment of the big unions and against the well-connected, distant corporate raiders who want to keep standardizing schools for profit and control. Jake Jacobs is a lifelong professional artist, a ninth-year art teacher in New York City, and father of two school-aged daughters. Jacobs began researching education policy in 2013 when he heard the nonsensical announcement that math or reading test scores would be used to rank arts teachers. Brilliant, wonderfully written and researched, painfully right about Randi and Hillary betraying teachers, students, and families in public schools. Thank you, Jake Jacobs, much appreciate. I take exception to a few of your assertions though agree generally and thank you for exposing the next con game in corporate edu-reform. But I wonder how you can be so sure that Hillary Clinton would win by a landslide if she swore off corporate cash. We have a mess in America in our post-Citizens United elections to be sure, but I have no hope with any of the Republican candidates (on so many issues), so it’s naive to think the teeming masses will come to the polls and make up for the lost cash. Andrea – Take out your history books. Thank you for asking Jake to elaborate on his views. Your explanation of the rhetorical launch of a “new agenda” is an example of speaking truth to power. Hillary, the ultimate power broker, has been aided in throwing teachers under the bus again by the teachers unions. And, as you point out, those premature endorsements from the unions simply add fuel to the idea that teacher unions are corrupt, stealing money from members for political deals not agreed to in a transparent process. The reification of test scores is still part of the ESEA reauthorization, and test scores are hardwired into many state policies for accountability— the result of USDE’s decision to make states compete for RTT funds. In fact, the “vision” of a transformed teaching enterprise comes from McKinsey & Co.and USDE’s 2010 technology plan. Key features: stuff the classroom with computers; pay “master” teachers to supervise 100 students, aides, and beginning teachers; work a regular “professional schedule, 50 weeks a year, 9 to 5, etc. etc. etc. In any case, welcome to the ranks of the policy wonks. I am a long-time worker in arts education. The practice of rating teachers of “untested subjects” by so-called distributed scores is a topic in my extended paper on the farce of SLO’s. If you want a copy, Mercedes can put us in touch. « John White Opts to Defer Charter Authorizer Approval…?